Ashes of Ariandel: Lore Analysis | Action Points! 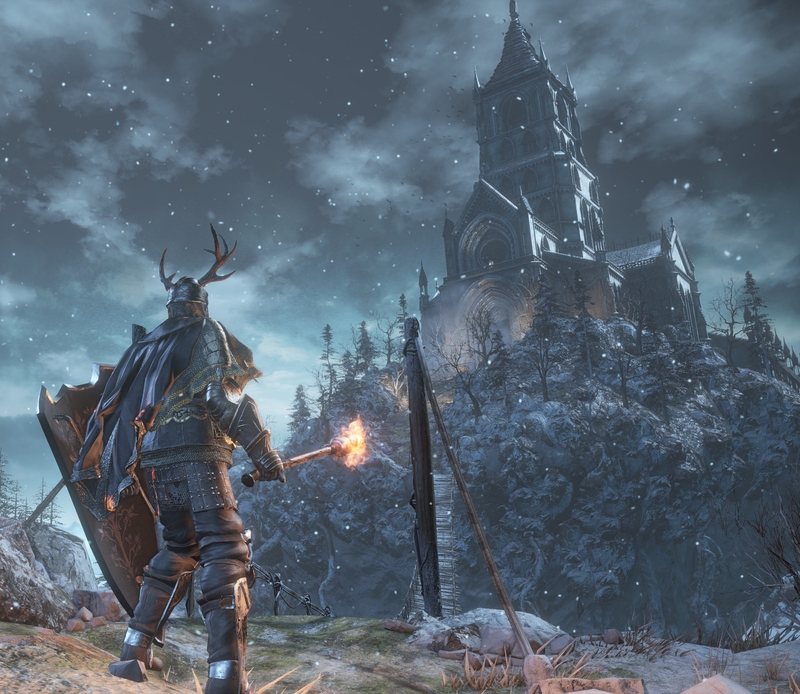 Note: These suppositions, speculations, revelations and conclusions were reached and realized with the help of Killian (@FionnBran) after a couple of days of ruminating on the items, characters, events, and descriptions contained within Dark Souls 3’s first DLC pack, Ashes of Ariandel; they contain MASSIVE SPOILERS for the DLC and main game. Please skip to the end for a summary of our speculations and assessment (without citations). Also, I will keep updating this article as more information comes to light. Ashes of Ariandel functions exactly as I’d hoped the first DLC would. It’s a miniature version of the main campaign, with summons, bosses, new enemies, and an almost completely self-contained world. It also returns to one of the most interesting places from the first game – an entirely optional, very hard to get to, cordoned off world contained within a painting. This time it’s called the Painted World of Ariandel, which leads us to speculate on who Ariandel is, and what this world’s relationship is to the Dark Soul’s Painted World of Ariamis. In order to access the Painted World, we meet a relative of “The Painter”: her Uncle Gael. Tracing the identity of The Painter (who appears not to be Ariamis, based on assumed family tree) is a fun exercise as characters are introduced, and her purpose is revealed. Gael asks us to touch a scrap of canvas in order to be teleported into the Painted World, much the same way we entered through the painting in Dark Souls. It should be noted that in order to access the Painted World of Ariamis, a small doll was required, just in the same way we needed one to enter Irithyll – a holdover from the Pontiff’s time in the Painted World. The location of the Small Doll in Dark Souls 3 is very nearby the entry point for this new Painted World. Pontiff Sulyvahn becomes the clear connection between the painted world and Irithyll, after the two spells we find tell us: “…the spells left behind by the young sorcerer Sulyvahn before leaving the Painted World… Sulyvahn was born and raised inside the painting yet had little use for his frigid homeland, since he had not yet experienced loss.” This tells us that he wasn’t “forlorn” enough (as all inhabitants of the painting(s) must be), and it might give us an indication of how the golden city of Anor Londo became so wintery. As we move through this “new” painted world we meet those living there who are lost, forlorn, and worthy of this quiet home. We meet a Corvian, who tells us the best thing to do would be to settle into “a sweetly rotting bed”. We can see the maggoty growth about the place. It pours out of the walls, it’s covered in GIANT flies in the depths of the chapel, and it vomits forth from the mouths of the more aggressive of the pitiful Corvians. It’s worth noting that the Corvians we meet in front of the chapel and the one near the first bonfire look the same as the ones we often find gathered near storytellers in the main world, but the ones in the township look very different. Their bird faces and bulging eyes look more like dying baby birds than the humanoid undead faces of the other Corvians. They either writhe in the pools of sludge, or stalk with stooped heads along the streets, many refusing to acknowledge you at all. They all carry disgusting sacks of muck and rot that grow out of their torsos and drag along the ground behind them. These Corvian Knights were at odds with their brethren. They found a new ruler in the ever gracious Sister Friede, the eldest sister of the Sable Church of Londor. She cuts a very familiar figure in her robe. She looks just like the statues of Velka, Goddess of Sin, whose crow-like followers inhabited the Painted World of Ariamis. Watching the movement patterns and attacks of the Corvian Knights shows us that these are the same creatures (perhaps more grotesquely depicted in Dark Souls as naked human lower halves with crows for upper halves). The statue that rotates when the mechanism is turned in Ariamis’ painting is back, and functions the same way in this world. The same mechanism causes it to about-face, and it opens up a path to a strange, giant figure hidden away below the chapel. Sister Friede (or Elfriede) has changed her appearance to potentially draw the affection of the forlorn Corvians, whose beloved Velka seems to have long been silent, acting only via a statue beneath the Undead Settlement in the main world. With the Corvian Knights on side, we hear what the rest of the pitiful Corvians had planned for their world before a new rule took over: Fire. Edit: As mentioned in the edit below, the statue on the mechanism that opens the boss chamber (presumably of Velka; the one that matches the statue in the Painted World of Ariamis) gives us further indication of Sister Friede taking the role of Velka. The statue’s head has been removed, and surrounding Friede are paintings of her own face. The head was possibly removed because the face didn’t match Friede’s own, and the paintings surrounding her replace the statue as reminders to the Corvians of their “benevolent” caretaker. Speaking with the seated Corvian in the township, we hear that they were all prepared to burn away the growing rot of the world, so that it could be painted anew, but it was Sister Friede and her allies that put a halt to their plans. Legend speaks (because of course it does) of two Ashen Ones entering the painting, and the second one bringing Flame. And as Uncle Gael and the Corvian beg us, we must be the one to show Flame to The Painter. His Onyx Blade description tells us that he was meant to leave her charge, but instead he had different plans, and followed her into the painting: “Elfriede, the eldest amongst her sisters and leader of the Sable Church, bestowed this sword to her knight. Only, the sword was a farewell gift, and acceptance signified the knight’s resignation from Elfriede’s service.” His armor set gives a more information about his relationship to Friede, and his role in her service: “Vilhelm, Knight of Londor… This hollow knight, who served the three sisters who founded the Sable Church, was particularly loyal to the eldest, and was known as a cold-blooded hangman.” This information about him seems at odds with his appraisal of us, as if he refuses to see in himself the same trail of destruction he sees in us. Of course, his dialogue could just as easily signify his estimation of the new path he now follows. After all, the Sister has left behind her siblings, and no longer strives to place a Dark Lord on the throne. Along with the Corvians, seemingly abandoned by their beloved Velka, we have others who ended up in the painting, with no other home left in the world for them. The Followers (of Farron) are without comrades in the battle against the Abyss, as they follow in the way of Artorias. Their brothers who shared the soul of the blood of the wolf (Souls of the Blood of the Wolf description: “The blood was spread amongst the Abyss Watchers, and their souls are one with the soul of the wolf blood master.”) have turned to madness and the Abyss itself, and their homeland of farron has been reduced to a poisoned swamp. Here in the Painted World of Ariandel they have a new wolf and a new champion. That the Followers and the Millwood Knights would end up in the same place seems inevitable. They fought the same enemy, although in a different form. From the Millwood Greatbow description: “It is said that the Millwood Knights used these to face their sworn enemy, the Abyss Dragon.” The Followers and the Millwood Knights both fought the Abyss, and when it either consumed their home, or their friends, they ended up in the painting. The imagery of the Millwood Knights leaving everything behind for a new life in the painting is particularly poignant for just a few lines of text. 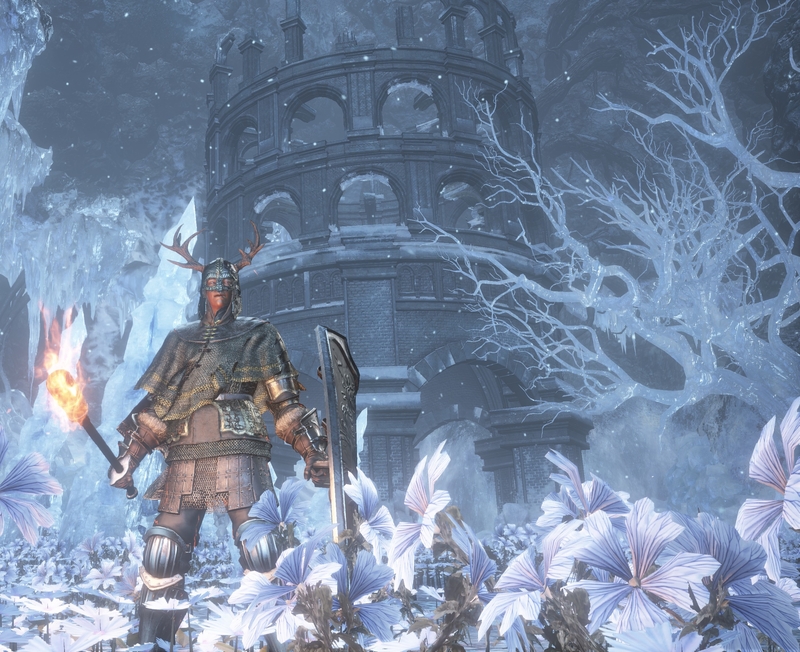 The first (and optional) boss fight of the DLC begins in a field of flowers, by a grave, with icicles jutting out of the ground. It clearly evokes imagery of both the fight against Sif, and of the final boss fight against the Lord of Cinder. There’s even a grave, with a sword in front of it. Once we disturb the man tending to the grave, he attacks us with a sword and shield combo that gives us some insight into the possible identities of both the man and the giant wolf that soon arrives at his side, mid boss fight. The Valorheart, as the sword/shield are together known, bears the following description: “Weapon once wielded by the Champion of the Undead Match… The champion fought on, without rest, until he lost his mind. In the end, only his page and a lone wolf stayed at his side.” The grave, and the giant wolf give us some indication that this small-statured knight must be the Champion’s page. Perhaps Sif, once he finished his service to Artorias, protecting others from being consumed by the Abyss, found a new home in the painting, but I think the thematic link is all that’s intended by this connection. A wolf, who is a warrior in their own right, will find kinship in a human warrior of incredible strength. They are man’s best friend after all. The image of a great dog waiting by his master’s grave seems to merely be a recycled motif, rather than any direct connection to Sif, despite the presence of the Followers (of Farron, and thus Artorias), just nearby. Arriving at the building where The Painter is being held, we’re attacked by Vilhelm, and after opening a way to her, she seems unfazed, but keen to return to her canvas. Friede and Vilhelm clearly didn’t wanting her painting a new world. All the sisters of the Sable church seem bent on usurping the status quo, even though this particular sister’s wishes seem in direct contradiction with her siblings’. She wants to let the Painted World rot and remain a champion to those seeking guidance and a home, instead of letting the natural course of death and rebirth take place. The seated Corvian in the village shows us the desperation of this decaying Painted World, and the suffering caused by prolonging its existence. When the Flame has finally been “unleashed”, we get a good idea from this same Corvian that the folly of the outside world matches that of Friede’s purpose for this painted one. Allowing the world to die is the only way new, uncorrupted life can really take hold. 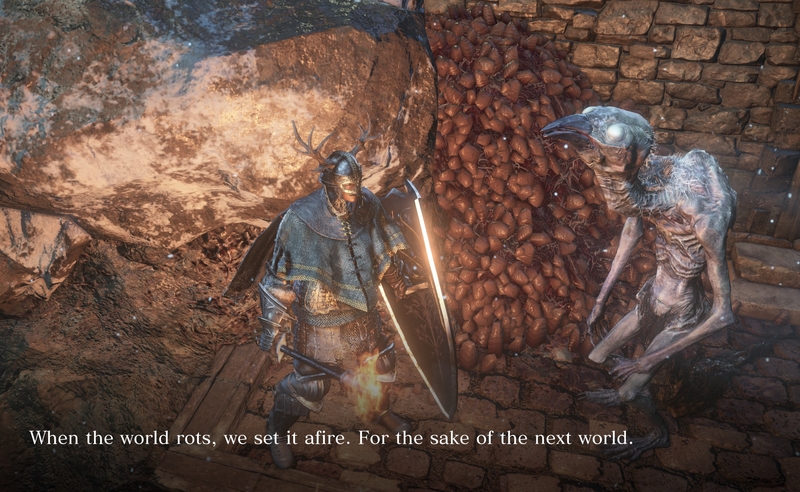 This advice from her mother shows that perhaps the meeting with the Chosen Undead from Dark Souls was canonical, and that the one who would Link the Fire brought destruction. Perhaps this child, a quarter dragon, with a long, snaking white ponytail to match her mother’s actual tale, has been forewarned of the dangers that dwell in the heart that seeks to own the Flame. Through this we get an understanding of why Priscilla’s tower, and the Chapel’s basement are of a similar layout to those in Dark Souls, but why they’re in the wrong locations. Father Ariandel presumably created this world from the canvas that was Ariamis’. Our own discussions have led us to suspect that part of the Father’s guilt lies in how he managed to restore the painting. If it was painted in blood, then perhaps we’ve found out the ultimate fate of the Painter Ariamis. There are two possible bodies who were the original vessels of the blood that was used to paint this world, if we assume it wasn’t just the Father’s blood. He “…knew it was painted with blood, and only blood could protect the secret.” We know of one death in the world, and that can possibly be explained by our player character from Dark Souls. Priscilla died, and left a grieving husband, and lonely child. Perhaps it was her blood that was used to restore the Painted World. 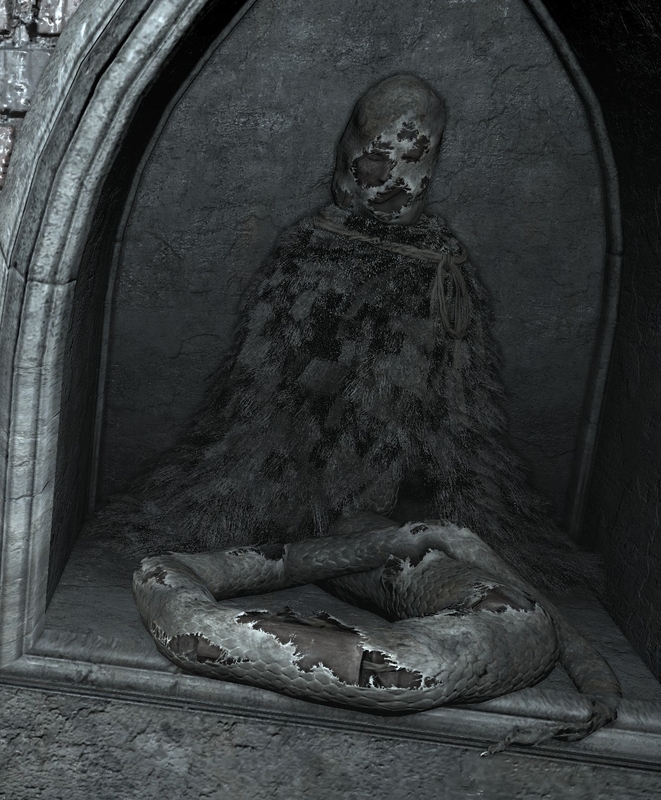 Another candidate presents itself in the form of a corpse or a statue situated behind Father Ariandel in the boss room. It’s been stuffed, and has a human face, with scales at the cheeks, similar to Priscilla and The Painter. Upon closer inspection, the entire statue/corpse has been covered in a snake skin, through which you can see the tail has been filled with logs, with a cord of rope through the middle, like some grotesque puppet. Its torso is covered with fluffy fur, and the face can be glimpsed through the torn snake skin that covers the face. Some speculate that this could be related to Priscilla, but I think perhaps we’re looking at the master painter himself. I think this very well could be Ariamis, and perhaps it was his blood that was spilled in order to restore the painting. Its position behind the Father, while he self-flagellates, could speak to his guilt about the statue, or it could just as easily be a strange memento. Edit: It has been pointed out that the head of the statue out the front of the boss chamber (which is the same one that rotates in The Painted World of Ariamis) is missing its head, and the face design matches the one hidden in the snake skin, so we now know where the face comes from. Names in Dark Souls usually indicate a family tree, and if Ariamis is related to Ariandel, and if this corpse belongs to Ariamis, then the only (and superficial) similarity is the fur-covered coat. The “bulbous” Father Ariandel isn’t just flagellating himself to assuage his guilt, but similar to the religious practice, he’s trying to avoid the temptation of the flames that pop into his mind’s eye, as he stares into the lordvessel-shaped bowl. 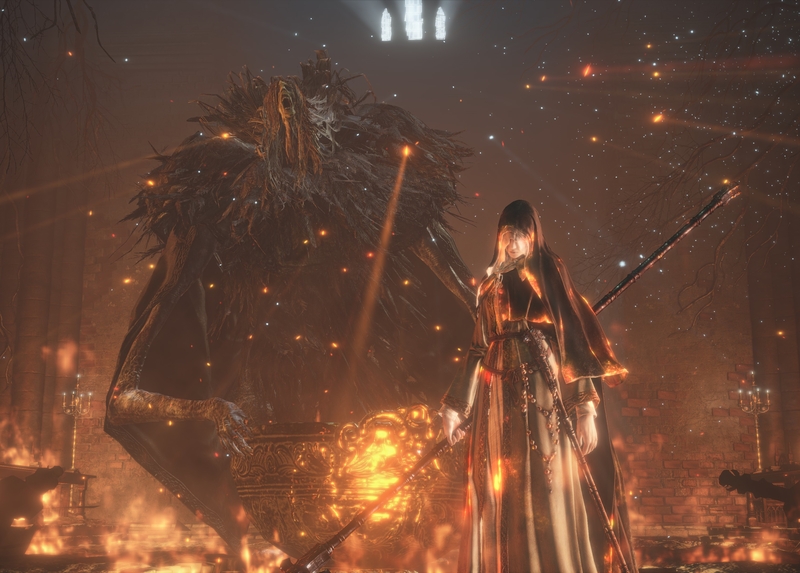 Sister Friede has convinced Father Ariandel to suppress the flame that would burn away the Painted World, along with its rot. While the two embrace the rot, the painting can’t be painted anew. To this end, The Father sits, tied to his chair, bleeding himself into the bowl for this dual purpose of resisting the flame’s temptation and demonstrating attrition, if not quite contrition, for the sins of the blood. As you approach the Father, he asks you to fetch Friede, but she walks in behind, wielding a scythe, much like Priscilla’s. 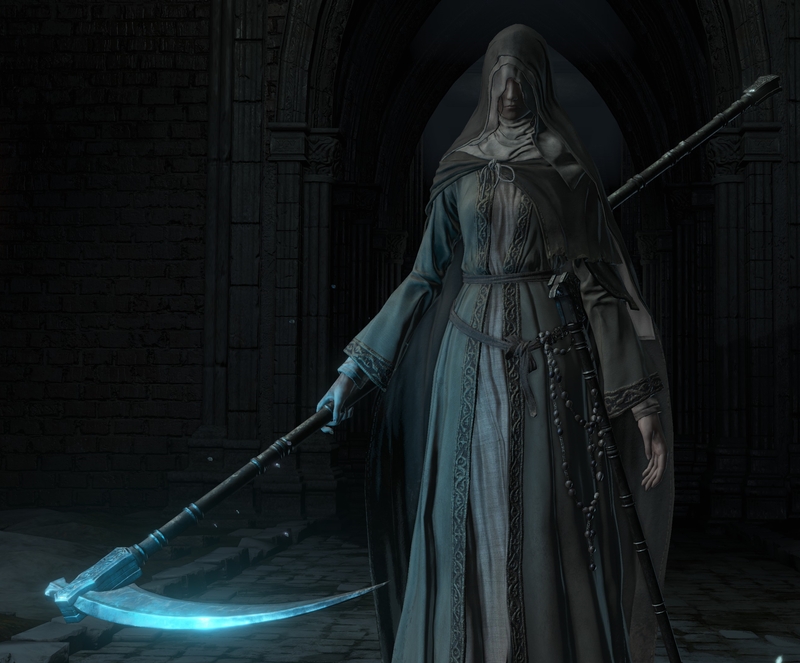 If we read the description of Friede’s Great Scythe, we see both why she uses it, and why a second, smaller scythe materializes: “A great scythe wielded by Sister Elfriede, with a curved blade thinly coated by Painted World frost that easily breaks the guard of shields. In the painting, the scythe is a symbol of a long-lost home, possibly explaining Elfriede’s preference for it. Conjure a magic bladed support scythe into the left hand while the great scythe remains in the right, a stance derived from Elfriede’s former swordsmanship…” The weapon signifies her kinship with the forlorn, as a symbol of a “long-lost home”, and the dual weapon stance is derived from her dual sword stance that she used back in Londor. As a third, unexpected, phase to the boss fight, Sister Friede gets up, this time under a new title, “Blackflame Friede”. The description of the pyromancy, Black Flame, gives us this definition: “Black flames born from the Abyss bear no shadow. They are said to be the impenetrable fires of humanity.” It seems that the meeting of the two Ashes has not merely created a flame, but one constructed of distilled humanity. And this flame, destined to reach The Painter, goes some way to explain her strange utterances concerning her painting tools. This incredibly interesting line tells us that perhaps The Painter will paint in different hues to Ariandel and Ariamis before her. Instead of blood on the canvas, she may wet her brushes with humanity, or human souls, or the Dark Soul taken by the Furtive Pygmy, or human dregs, or the pus of man, or even the Abyss itself. It’s a rotten tease at an eventuality we may never see. In a strange way, Friede may have brought about the wishes of her two sisters within the painting: Darkness may guide the future of this Painted World, and not the usual cycle of fire. Whose blood was used by Ariandel to restore the painting of the Painted World? Who is the statue/corpse situated behind Father Ariandel? What will a world painted using the pigment of the “dark soul of man” manifest as? 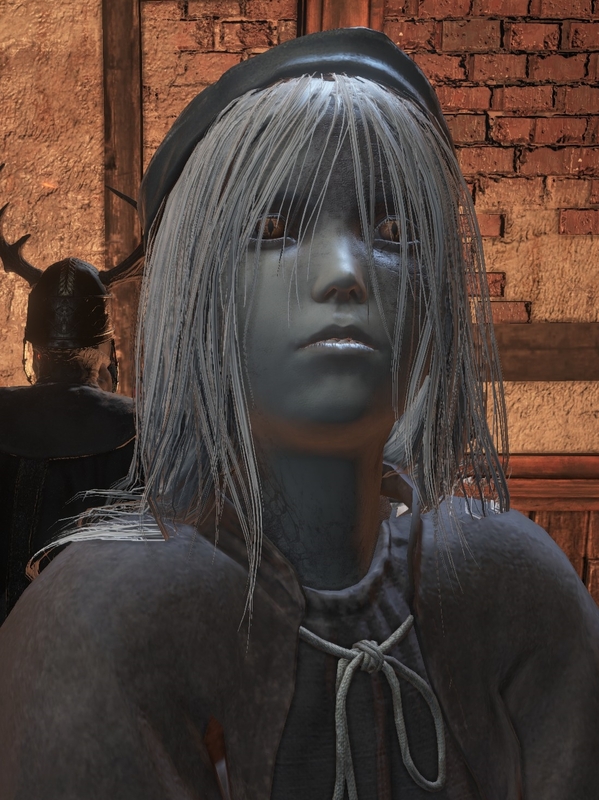 Did Elfriede’s turning “to Ash” bring out a dark flame, at the point when the “Ashes are two” because of her connection to Londor and the Sable Church? The DLC is only a couple of hours long, so reading all the item descriptions added a few hours to that. Maybe 15 hours? I’ve spent 300+ hrs in DS3 😊. Thanks for stopping by! Wow, it took me like 5+hours to defeat the tutorial boss with my first champ. I was almost crying when he died. Yeah, the bosses were TOUGH, but I’m not the kind of person who needs to fight them by myself. I summoned a friend for the bosses (and most of the areas) so we could play through it twice while discussing it together. I’m actually kinda terrible at the Souls games, but I LOVE lore hunting :D. When I first completed DS3 (it was my first Souls game), I did everything but a few bosses by myself, and it took 64hrs. I didn’t feel the need to solo the DLC XD.